We have been going through a series on the seven churches in Revelation. Revelation 2-3 are letters of Jesus to seven particular churches in Asia Minor (Turkey). Jesus told the apostle John to write on a scroll what he saw and send the message to those seven churches. We have covered thus far, Ephesus, Smyrna, and Pergamum; today we will look at the church in Thyatira. Thyatira is mentioned in Acts 16:11-15 While Paul visited the city of Philippi there was a woman there named Lydia from the city of Thyatira. It was a very small city, but a busy commercial center. It was on a major road of the Roman Empire, and, because of this, many trade unions had settled in this city. This city was known for its trade guilds. It was hard to get a job in this city for a Christian unless you belonged to the union. Son of man (1:13) and Son of God (2:18) refers to the same person, Jesus. Commendation (v.19) Jesus knows what goes on in the church. “I know your deeds, your love and faith, service and perseverance. You are doing more than you did at first. (your works are better than before) (Ephesus did better at first and Jesus told them to do what they did at first). The church at Thyatira was doing better now than what they did before. Concerns: (20) Nevertheless, I have this against you: You tolerate that woman Jezebel, who calls herself a prophetess. Tolerate: to leave alone or permit. This woman’s teaching was misleading God’s people into committing sexual immorality and idolatry. Jezebel in the Old Testament was the wife of King Ahab, king of Judah; she thought to get rid of all the prophets of the LORD; Elijah ran away from this woman (I kings 19:1-3). She was bad news and the one responsible for introducing in Israel the worship of Baal and Ashtoreth fertility gods. (1 Kings 16:30-33). In Thyatira there was a Jezebel-type of woman leading God’s people away from the Lord. Jesus is not happy because the church tolerates this false teaching. Jesus is intolerant of false teaching and he expects his church to be as well. Anything that leads people away from God, you should not tolerate or accept. He told the church I have this against you, you tolerate (permit this false teacher Jezebel to lead my people way from me). Repent (v,21) God always gives people the chance and opportunity to repent (change their ways). I have given her time to repent or her immorality, but she is unwilling. When people refuse repentance, then God brings judgment and punishment. This false prophetess refused to repent. Repentance is the only thing that would keep this from happening. The church will know who I am. Hold on to what you have until I come. (Hold on to love, faith, service, perseverance, your good deeds) Hold on to that until the end. –The morning star: Jesus is called the Bright morning star Rev.22:16. Scripture teaches us that if we partake of Christ suffering here on earth, we will also partake in his glory. Christ will share his splendor, his glory with those who overcome. Rom. 8:17 Now if we are children, then we are heirs–heirs of God and co-heirs with Christ, if indeed we share in his sufferings in order that we may also share in his glory. Whoever has an ear, let him hear what the Spirit says to the churches! What is the Spirit saying to the churches today? What does Jesus expect of his church? -Jesus expects a loving church, strong in faith and service, one that endures and perseveres in trials. 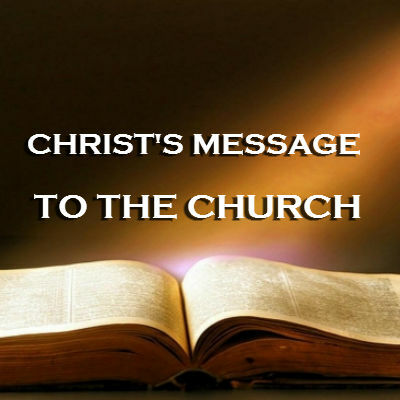 –Jesus expect his church to be intolerant of false teachings or practices. Christ does tolerate false teachings and neither should his people. -Jesus expects his church to hold on to him until the end. -If the church has been backsliding in doctrine or teaching; Jesus expects her to repent and come back to following him with all their heart. Jesus expects his people to overcome in this world; If you abandoned the teachings of Jesus or quit running your race as a Christian, then don’t expect to share in his glory with him. He calls his people to overcome. Only those who overcome will share with Christ in his glory. Church, there will be lots of things we still have to overcome: persecution, cultural system, government, false teachings, trials, etc. as we wait for our master to come and reward our faithfulness to him.